The Bag Ladies specialize in printing all styles of bags for trade shows, special events and retail stores. We know how to customize your bag so that you will make an impression and increase sales. At a trade show you have micro-seconds to grab attention and be remembered. Bags have always been the number one give-away that customers will collect and reuse. Custom printing is an inexpensive and highly effective means of marketing your brand in a highly competitive marketplace. 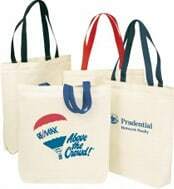 Our most popular trade show bags are the plastic patch handle bags and soft loop handle bags. Also, the Eurostyle Laminated bag and the Polypropylene bags have enjoyed recent popularity as well for their strength, looks, and reusability. For the retailer, we strive to become the one stop shop. 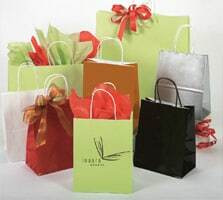 We’ll supply you with a full line of shopping bags and accessories such as ribbon, boxes, bows, and tissue paper. Please download our catalog or request one by mail to view our full line of bags and packaging. 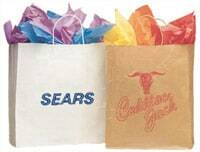 Plastic bags are our most cost-effective and popular selling bag for both retail and trade show use because they are both durable and reusable. They are highly chosen for their limitless graphic potential from a simple one color logo to elaborate photographic four color process reproductions and everything in between. They are compact to store and easy to ship. We offer a full line of popular styles including: patch handle, drawtape, drawcord, soft loop, rigid loop, rigid bridge, as well as litter bags and doorknob bags. 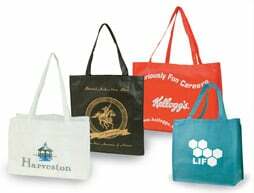 Plastic bags are the most popular choice for openings, promotions, give-aways, special events, trade shows, and retail use. Most of our plastic bags are 100% recyclable and are invaluable as a tremendous marketing vehicle. Check out our selection. You’ll see why they are the most popular bags in our line. We also have a large assortment of frosted plastic bags for another economical alternative. They are durable and reusable. Most frosted plastic bags are 100% recyclable, and we offer them in different handle styles, colors, and sizes. 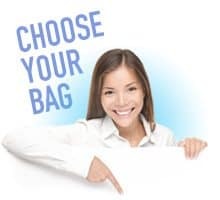 Choices include: frosted eurototes, frosted soft loop handles, frosted tri-fold handles, frosted die-cut handles, frosted soft loop ameritotes, and frosted superwave bags. All of these bags are available plain or custom-printed. 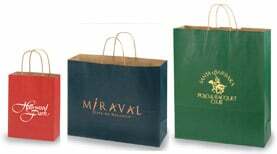 Natural kraft paper shopping bags and white kraft paper shopping bags are the least expensive paper bags in our line available in a full range of 13 sizes. They are 100% recyclable and the natural kraft bags are made from 50% recycled materials. We also have a new line of 100% recycled natural kraft shopping bags available in 4 popular sizes as part of our newly introduced “Go Green” program. These bags are printed with water based inks and are very gentle on the environment. Another alternative to add some fun and make a more colorful statement are our tinted kraft paper shopping bags also made from 50% recycled material. Hot stamp your company logo on these bags and add a contemporary look. Choose from a large selection of 16 dazzling designer shades with a shadow stripe texture sure to please any taste. If you prefer no texture on the bag, we offer 4 shades in a solid tint kraft finish as well. We have added a new “mini” size to this line for small accessories. We also have our elegant and understated Metallic kraft tint shopping bags available in copper, silver and gold which are an earth friendly choice that adds a touch of class to any presentation. Mix and match it with our apparel and gift boxes also available in tinted kraft colors for a totally coordinated look. 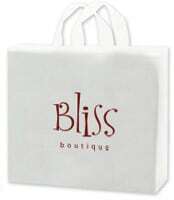 Our gloss coated shopping bags lend themselves beautifully to hot stamping your logo or message and have a timeless and upscale appeal. They are available in a silver, copper, fire engine red, black, or our new celadon green designer color. Add some tissue paper to make an unforgettable packaging statement. 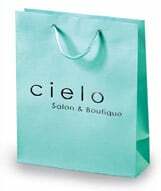 For the ultimate paper shopping bag, a very popular choice has always been the matte laminated or gloss laminated eurotote. These bags come with color coordinated macramé rope handles and cardboard reinforced tops and bottoms. They are the absolute “top of the line” in elegance and sophistication. Laminated eurototes are prestigious and are often sought after by customers who love to collect and reuse them. They are also popular at conventions, trade shows and high-end retail stores for their beauty and durability. We are now offering these bags in a thicker and heavier weight paper stock of 180 gsm (versus 157 gsm) which was just introduced. We urge you to compare the difference in quality to our competitors. We have one of the largest selections, available in both the shiny gloss finish or matte satin finish. We also offer the white kraft eurototes and natural kraft eurototes as another option. All eurotote bags are available unprinted for immediate shipment or you can add your custom logo for a truly one of a kind packaging statement. As part of our ever popular Go Green program the following bags are gentler on the environment as they are made from 25% post consumer recycled content: clear frosted superwave bags, clear frosted soft loop handle bags, white high-density merchandise bags and white high density tee-shirt bags. A very popular choice for reusability, strength and endurance are our polypropylene bag line. These bags are considered to be part of our “Go Green” program for they are reused over and over again and are good for our planet. Their advertising potential is limitless. Our polypropylene bags are popular for their featherweight lightness yet are extremely strong and durable. They are 100% recyclable and are immediately available in a wide variety of colors and sizes. We also quote custom orders if you need a higher quantity, special size, or multi-color logo. to your specifications, please give us a call for a quote. We also offer a full range of packaging items. Please click on our download catalog link or call to request a catalog mailed to you. In our catalog we highlight a great assortment of jewelry, gift and apparel boxes, bows, and raffia. We offer the full Satin Wrap tissue line known for their very high quality and wide variety of choices which is certain to appeal to all tastes. 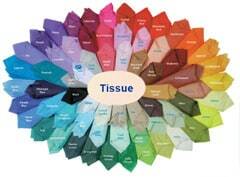 Check out our tissue paper choices in: solid color tissue, designer print tissue, crystallized tissue, tiara premium tissue and gemstones tissue. If you are looking for a bag display stand for your next trade show, look no further. We now offer this as well to help insure more traffic to your booth. It is a convenient way to display your bags at your next trade show.